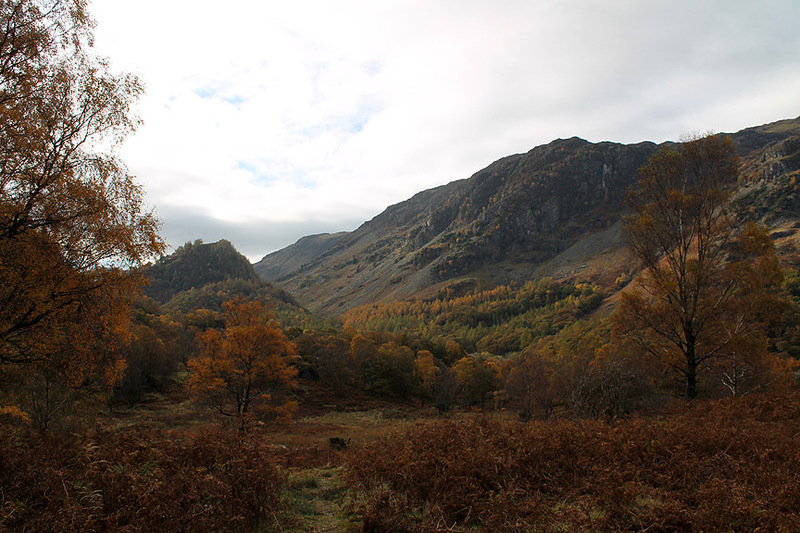 " Kings How ~ Brund Fell "
Date & start time: 27th October 2012, am start. 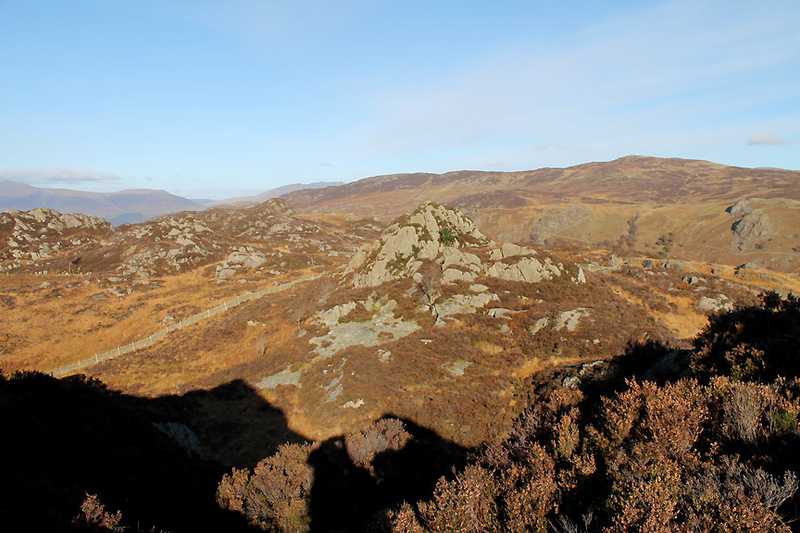 Places visited : Great End Crag, Grange Fell (Kings How / Brund Fell / Jopplety How) back down to the Bowder Stone. 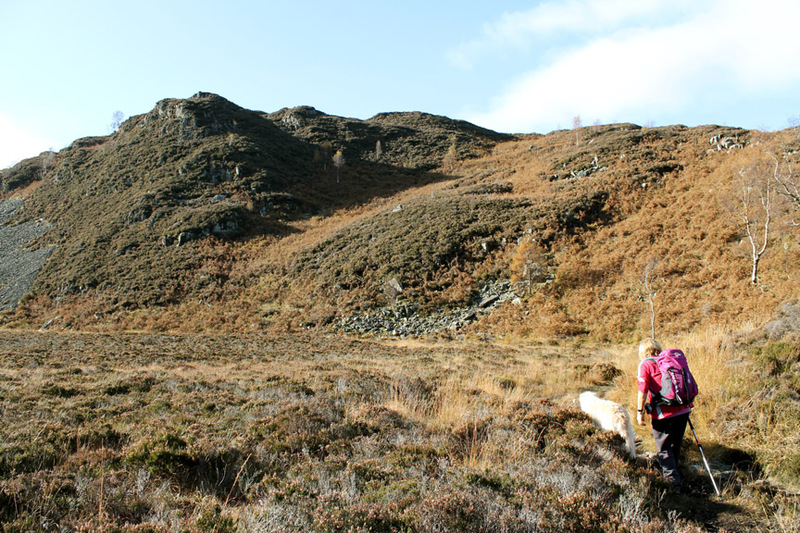 Walk details : 3.5 mls, 1375 ft of ascent, 3 hours 15 mins. 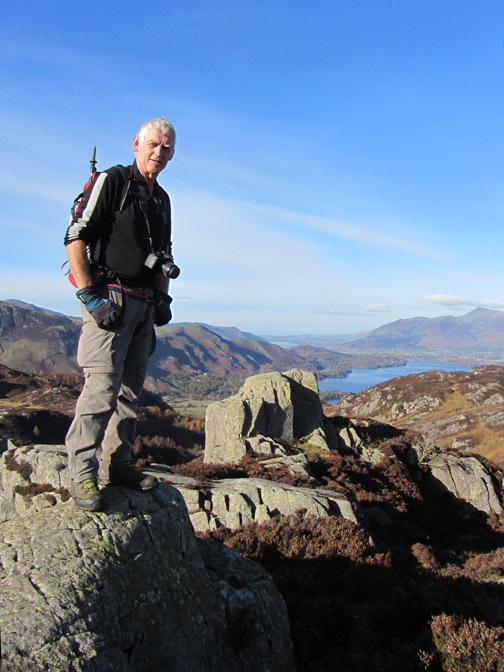 Highest point : Grange Fell, 1,345ft - 410m. 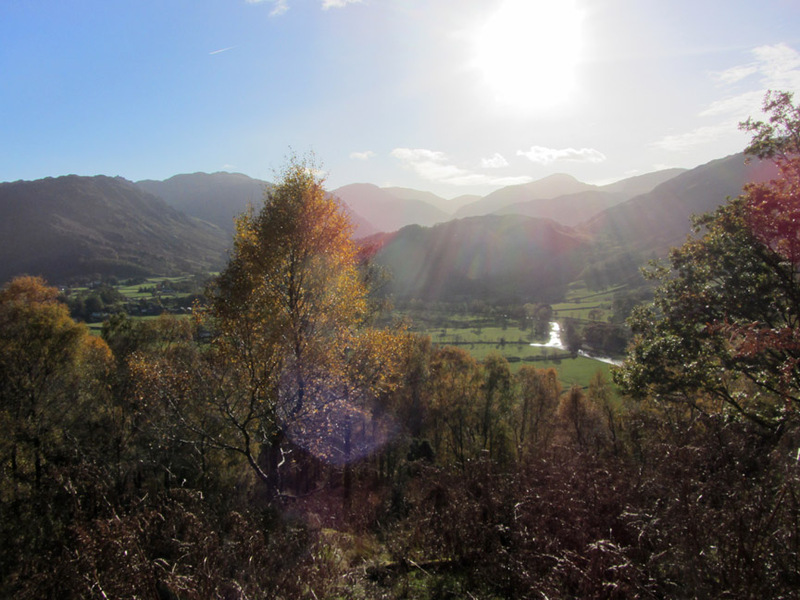 Weather : A crisp, fine, sunny autumn day. 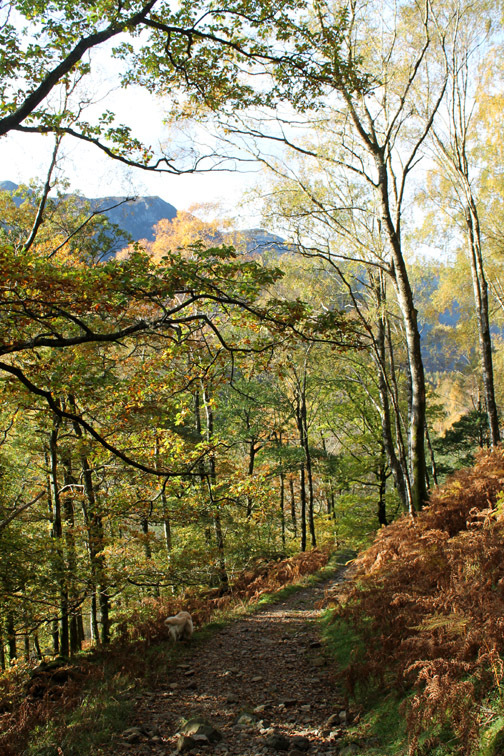 we pack lunch in a rucksack and head over to Borrowdale in search of more Autumn colour. 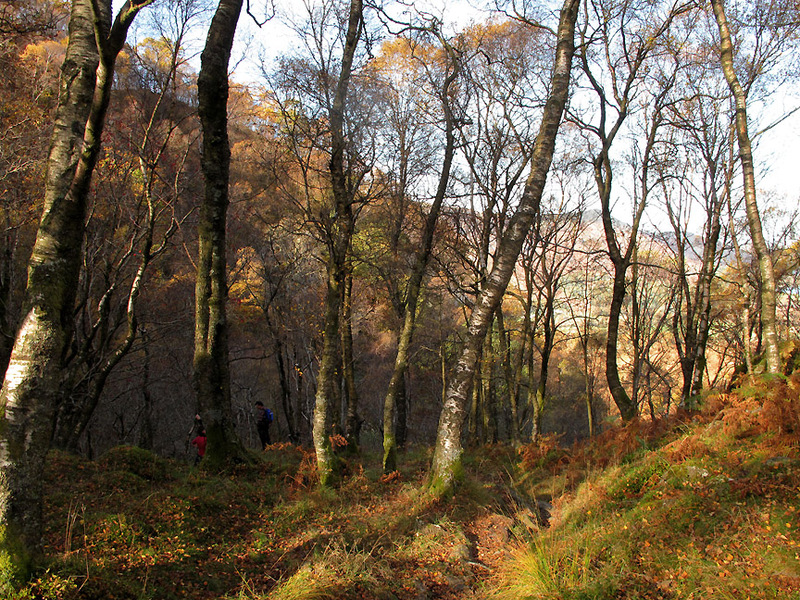 King's How via the steep steps should be a nice woodland walk. Starting point . 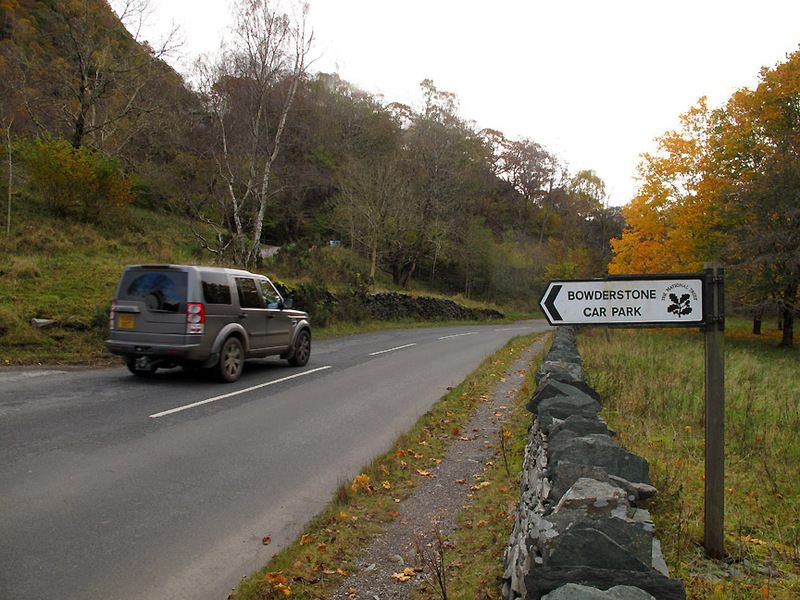 . . the National Trust car park in Borrowdale that serves the Bowder Stone attraction. 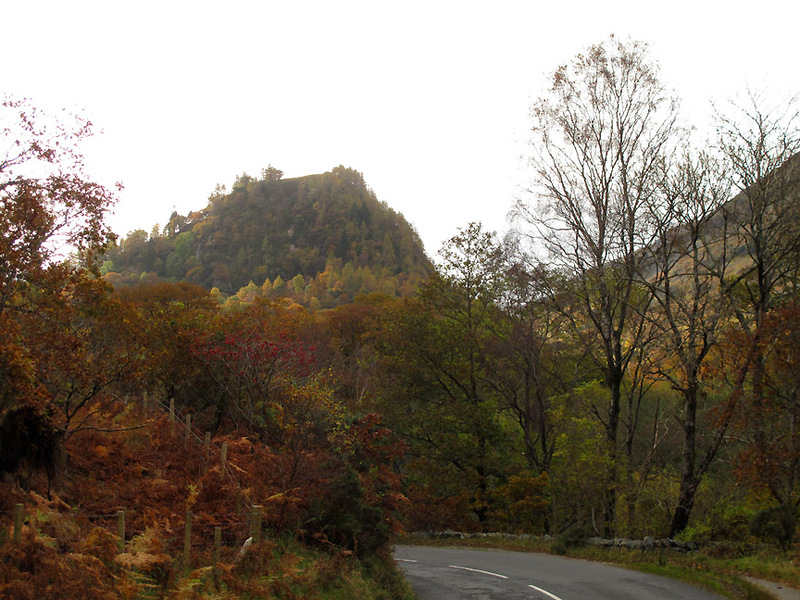 A short walk down the road towards Grange allows us to look back at Castle Crag sitting proud in the Jaws of Borrowdale. The forecast was for a clear skies day but since eleven o'clock the skies have clouded over. This is most disappointing . . . it wasn't supposed to happen till later in the day ! 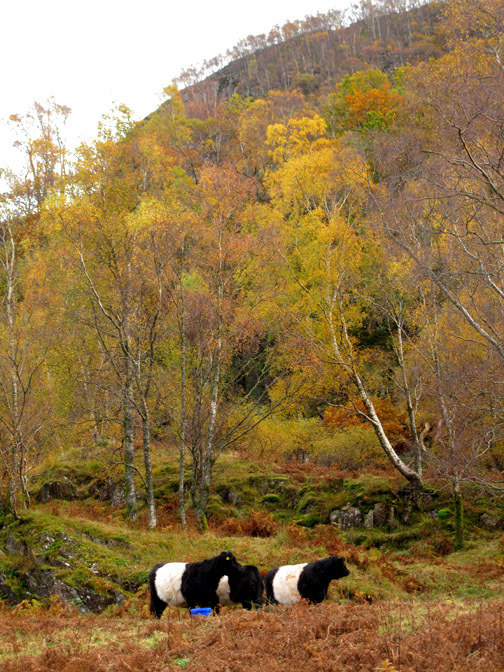 Belted Galloway Cattle grazing quietly in the woods. 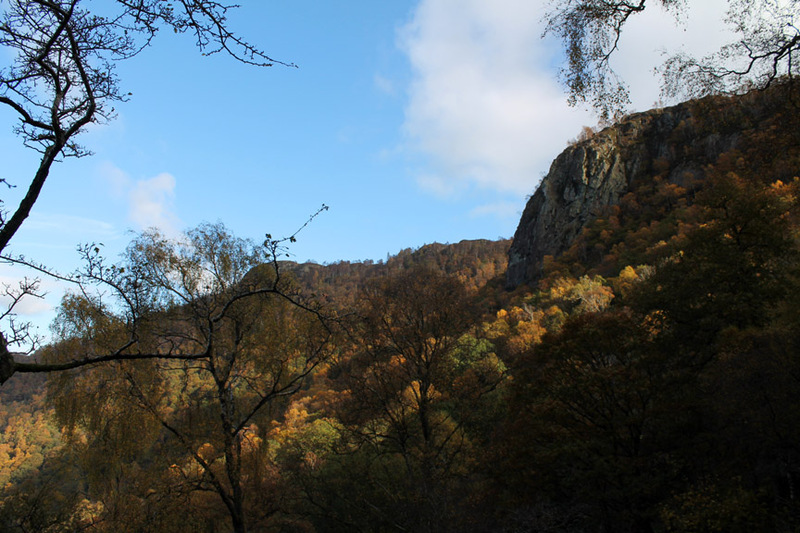 Almost a Constable-style oil painting as we look back at Castle Crag and High Scawdel Crags. 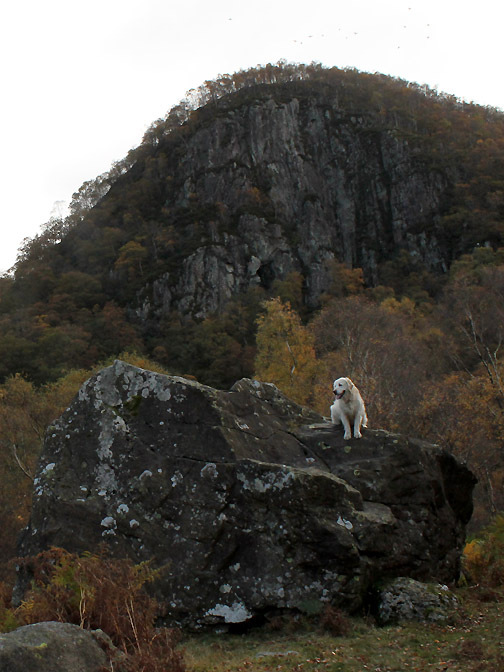 Bethan on a mini-Bowder Stone under Great End Crag. 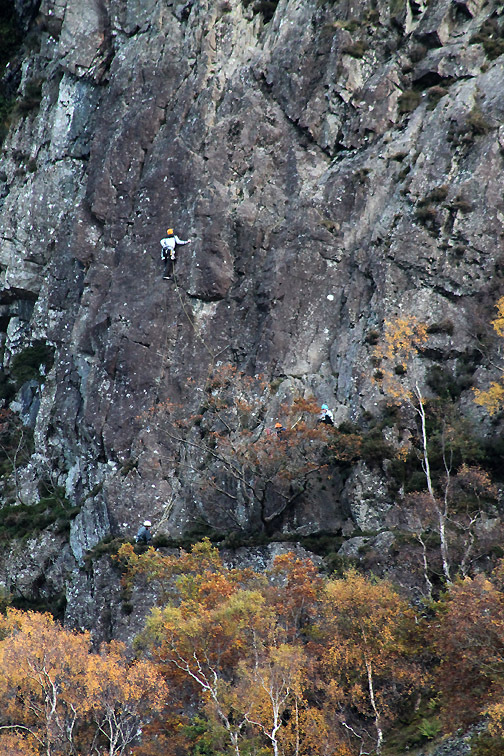 Black Crag is home to the Troutdale Pinnacle, a famous local rock climb. 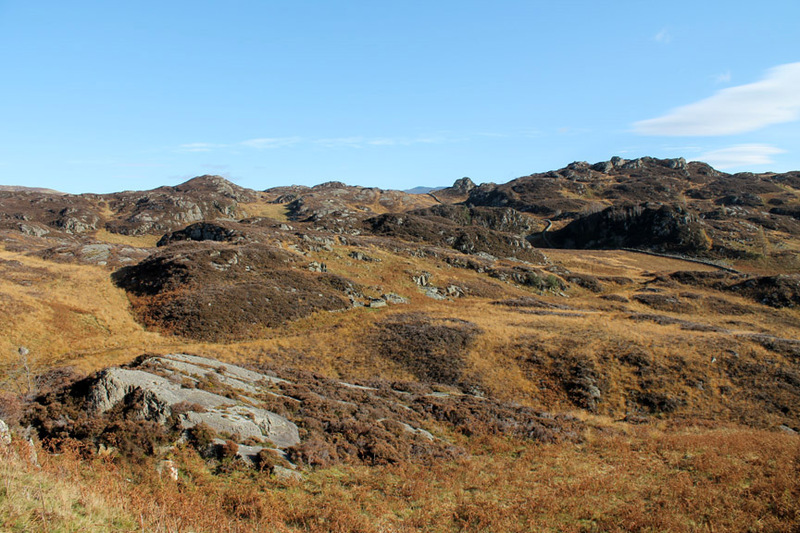 King's How has an easier ascent on a steep, pitched path. As we climb the overcast nature of the weather began to change. Blue skies and sunshine have started to return. 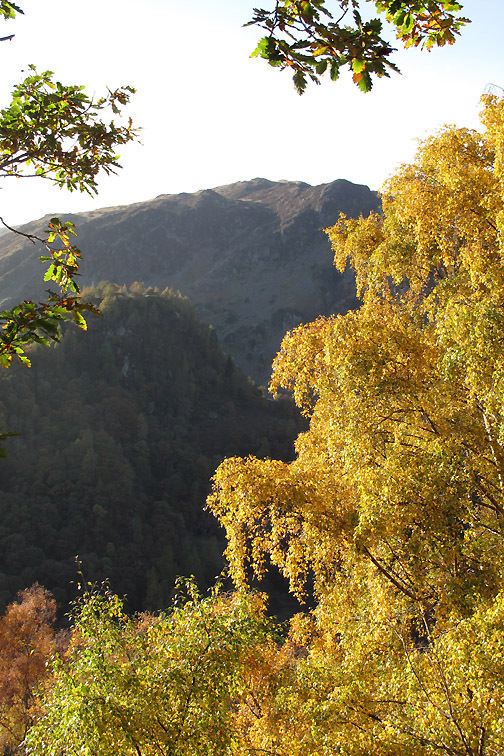 The colours of Autumn, the rich reds and browns are one again responding to the sunshine. The top of the climb . 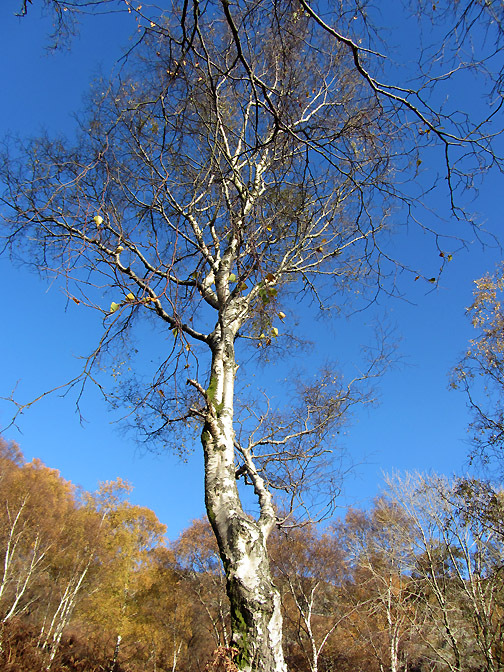 . . up through the birch wood. 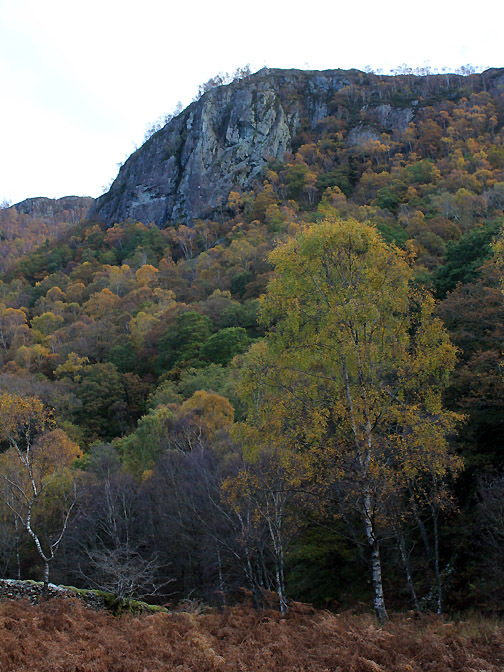 Wainwright described it as . . . . " in Autumn, a golden ladder to heaven" . . . on a day like today he was spot on with his description. Silver and blue . 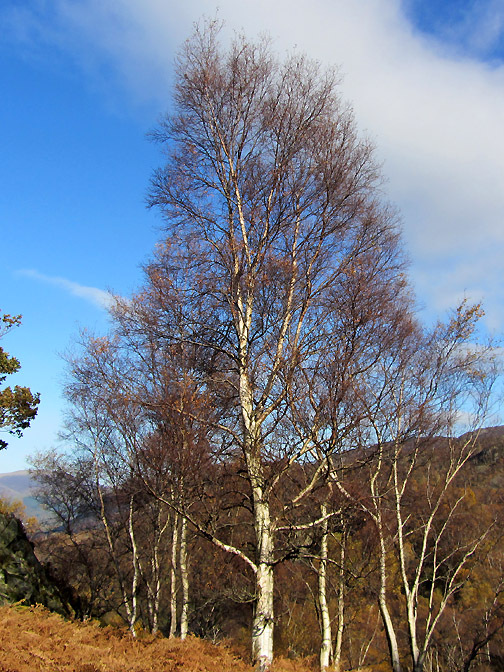 . . birch and atmosphere . . .
. . . the clouds are all gone and the sun is warming us again. 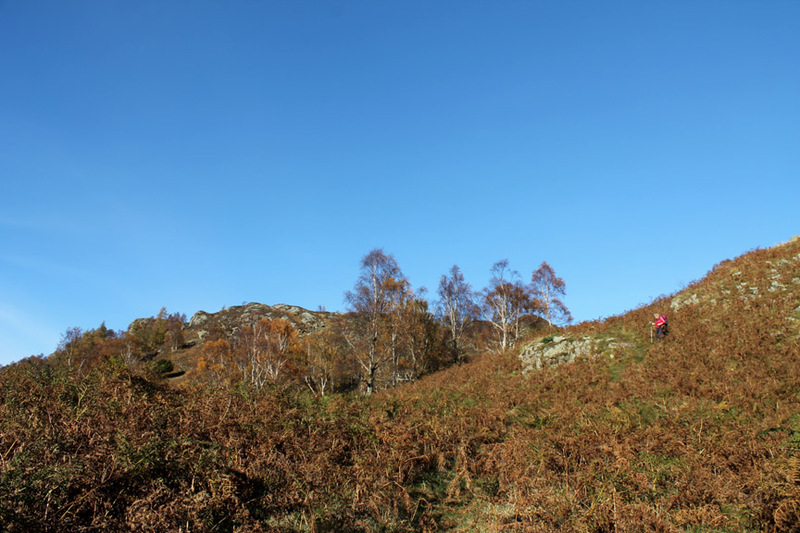 A careful walk around the edge of Long Moss, with King's How ahead. 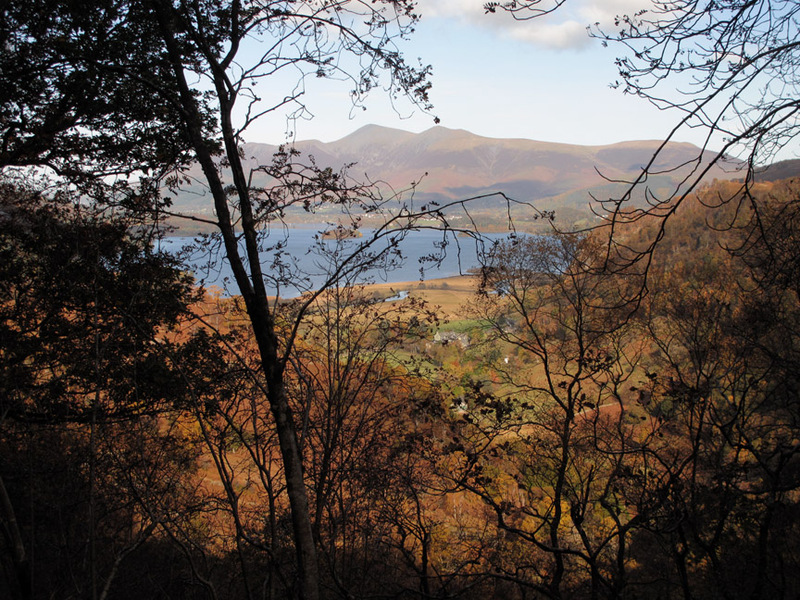 Once onto the final climb to the top we leave the trees and get a clear view of Derwent Water once again. 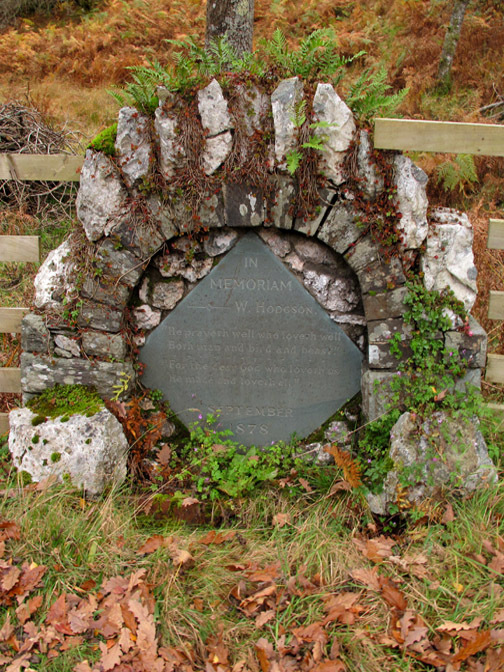 and through the National Trust, donated it to the nation as a memorial to the late King. 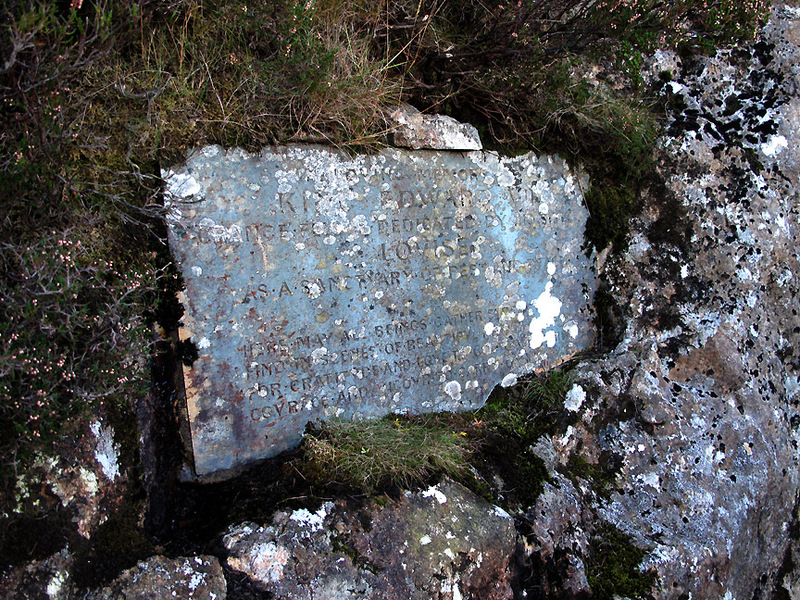 The plaque records the facts for as long as the writing remains legible. Summit photo . . . King's How . 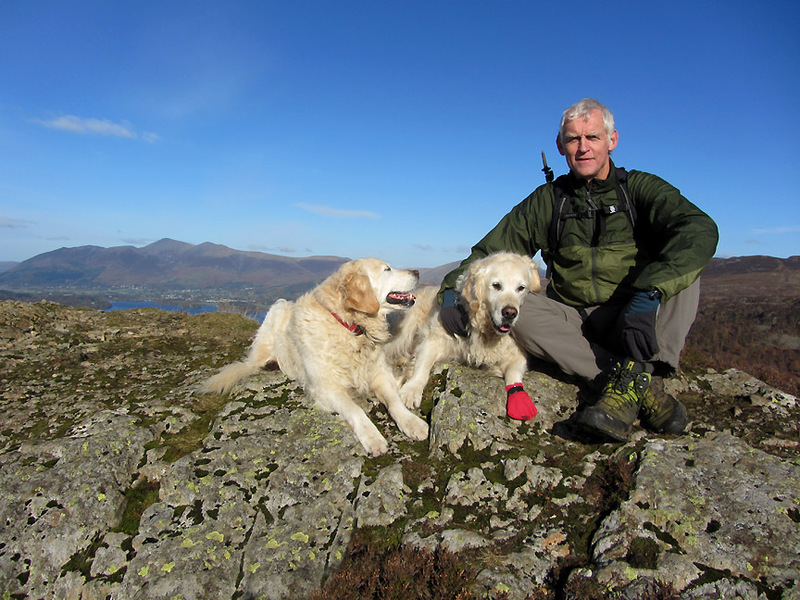 . . one man and his two dogs. Far better . . . two dogs on their own ! Harry's red sock is temporarily removed to replace the sticky tape that holds it in place. His pad seems almost completely healed now but we'll keep the sock on for a while longer to make sure it stays that way. 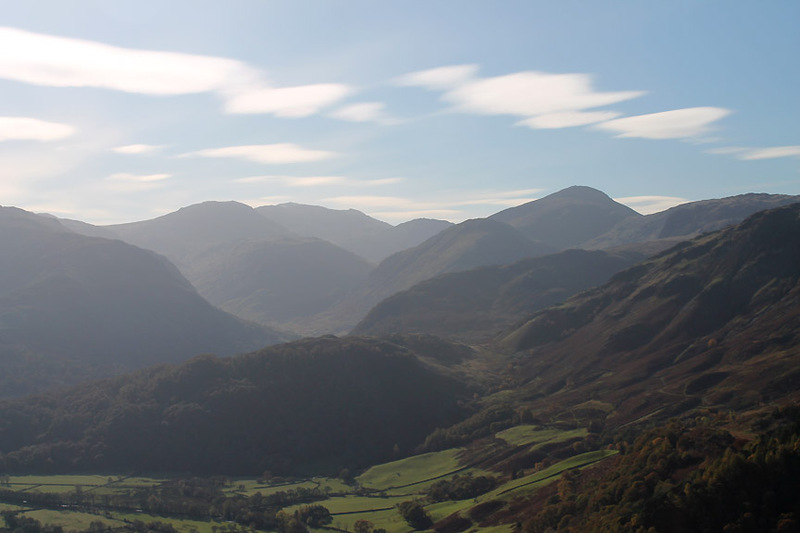 From the summit there's a great view up Borrowdale to the high fells. 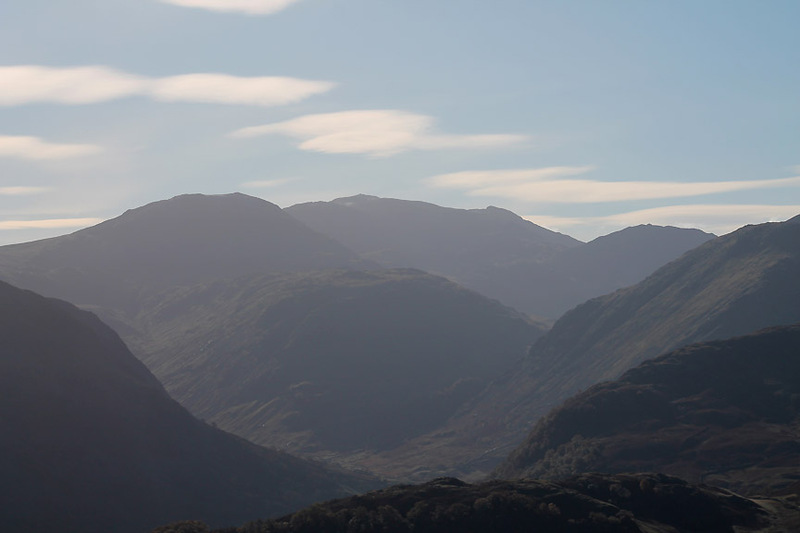 Zooming in on Seathwaite Fell, Great End, Lingmell and of course . . . 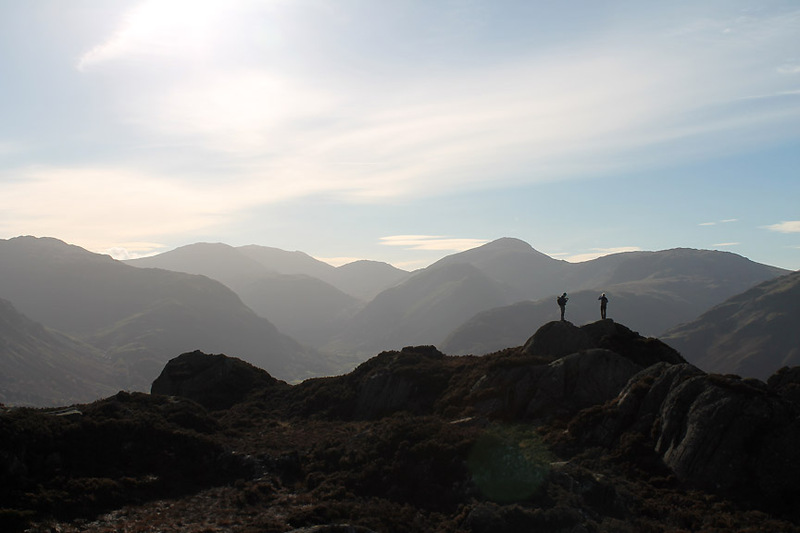 The summit of England . 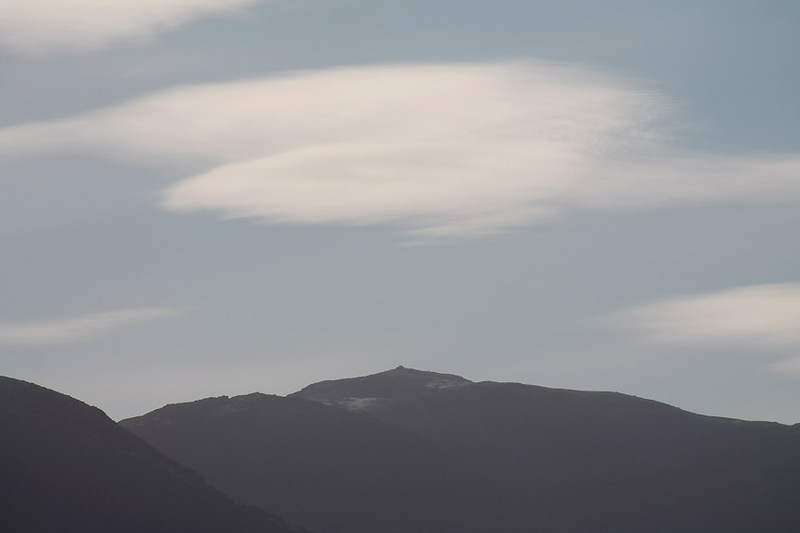 . . Scafell Pike. Easier to see . 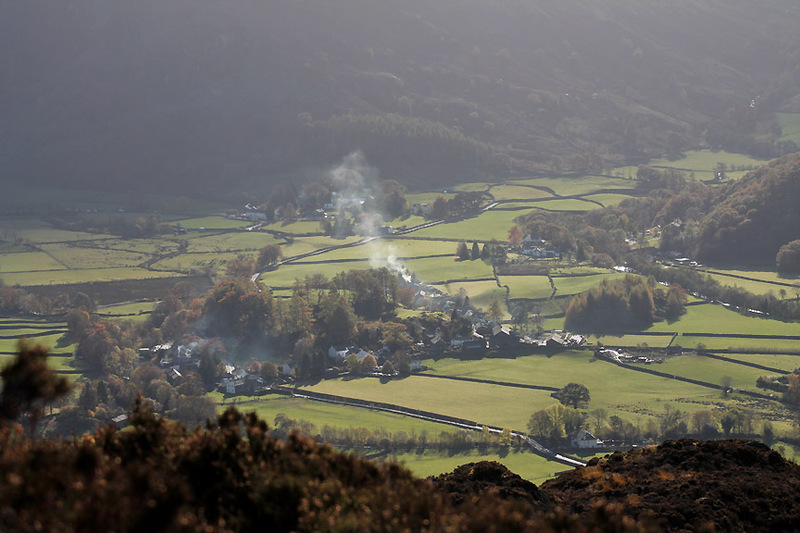 . . the village of Rosthwaite below us in the valley. The confluence of The Crook with Stang Dub . 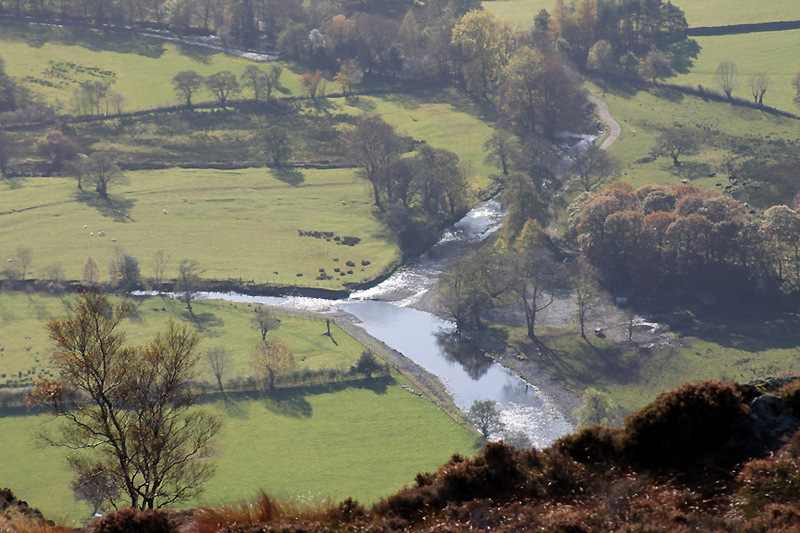 . .
Seathwaite Beck with the River Derwent. 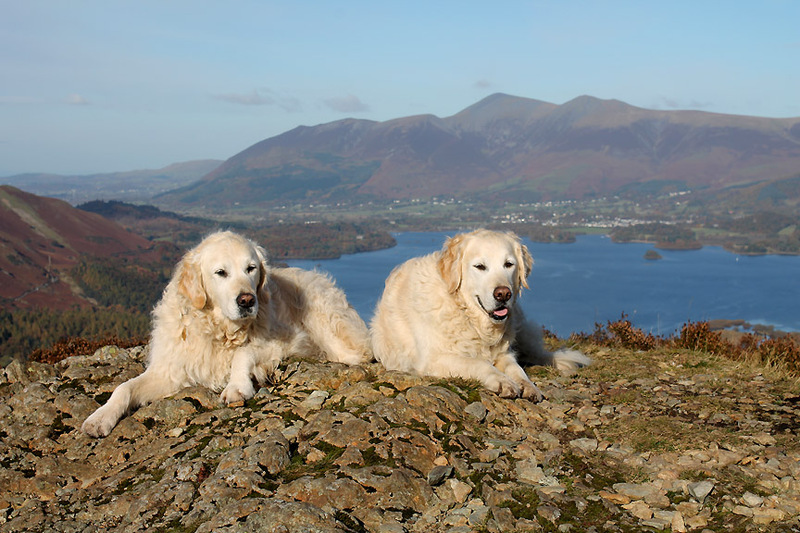 I thought a picture of Helvellyn would be nice but these two thought it needed foreground interest. 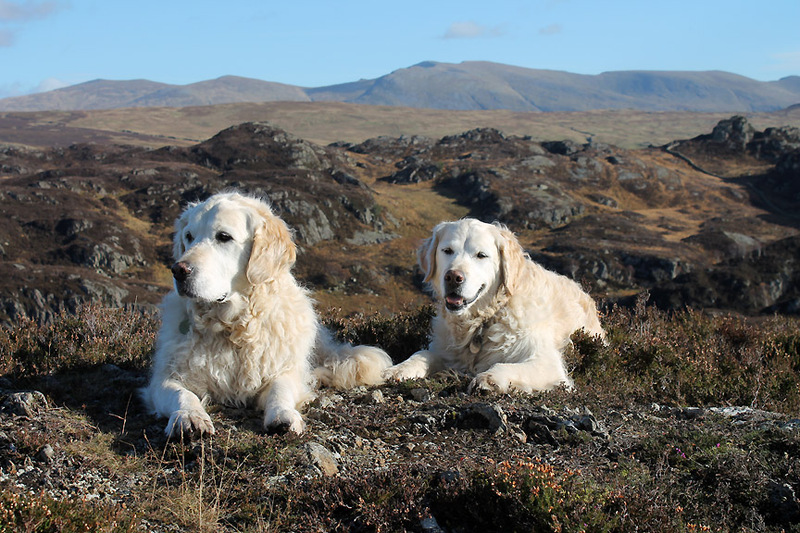 Late lunch consumed, a few dog biscuits lighter in the pack, it was time to move on . . .
the delightfully named Jopplety How. Half way across the last photo we stop and look back at King's How. It is surprising such a nice viewpoint was not rewarded with a chapter and a summit status of its own. 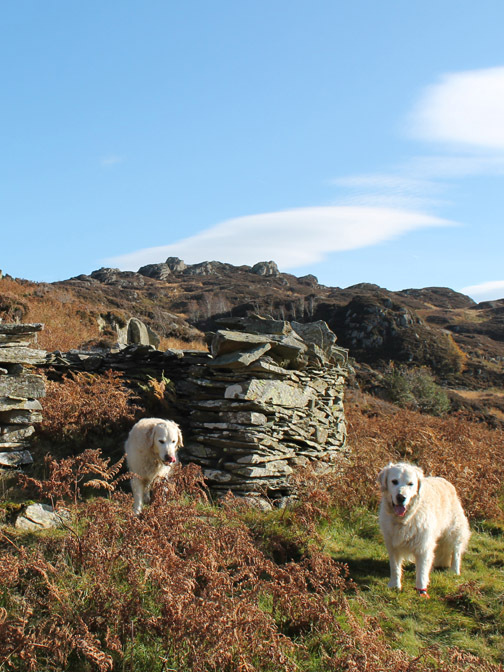 Bethan and Harry at the sheep fold.
" 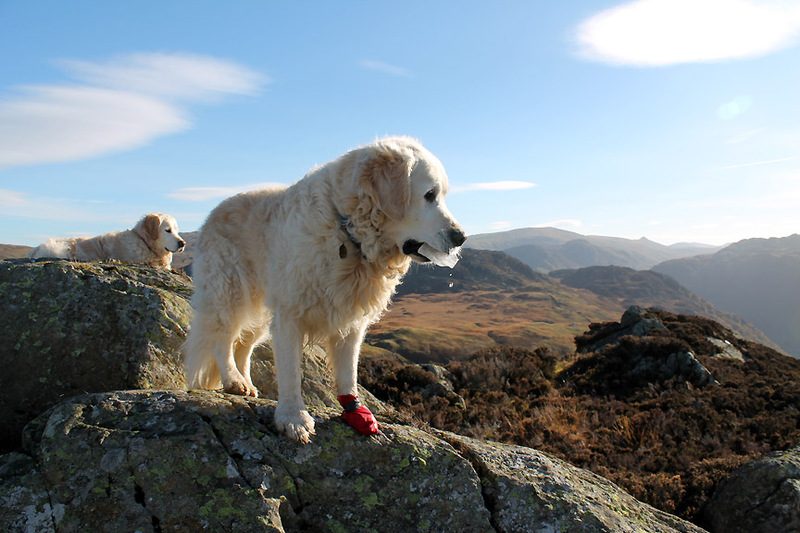 Did I tell you I had a poorly foot ? " " It is not that bad Harry, don't milk it " . . . but it is a great sympathy-winner with people he meets." 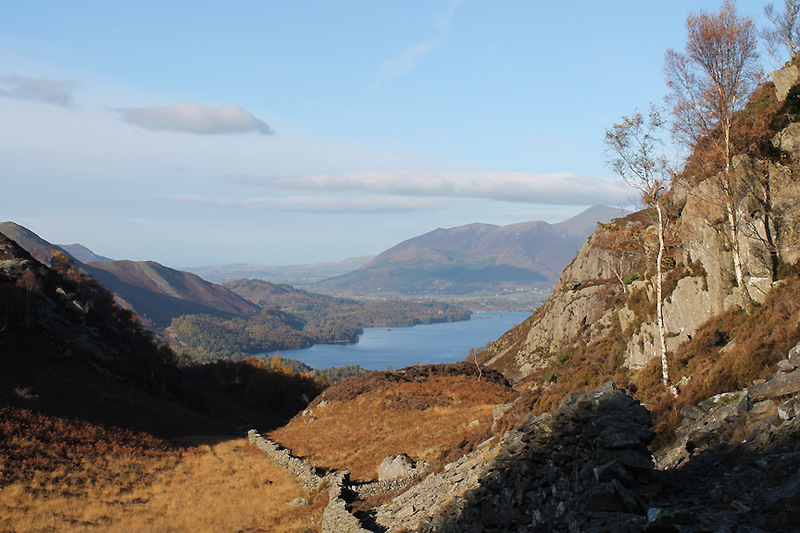 The view north from Brund Fell. Warm but not that warm . . . hence the gloves. 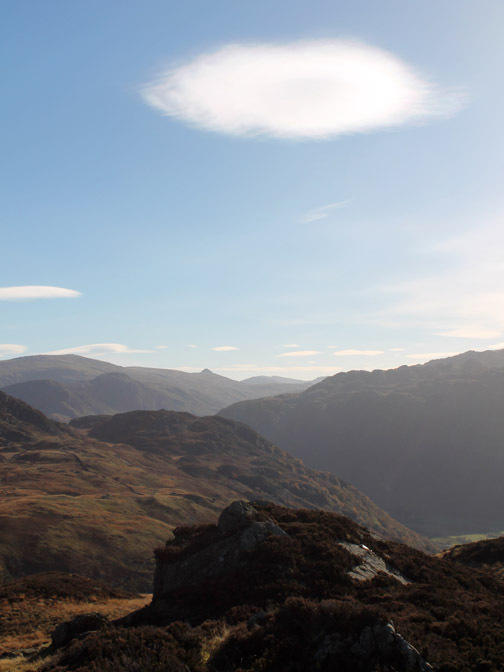 Looking south toward Langstrath and Pike O'Stickle. The clouds were intriguing . . . it would have made a great halo for the previous picture . . . but then I'm no saint . . . so that's out then ! It was cold up here last night . 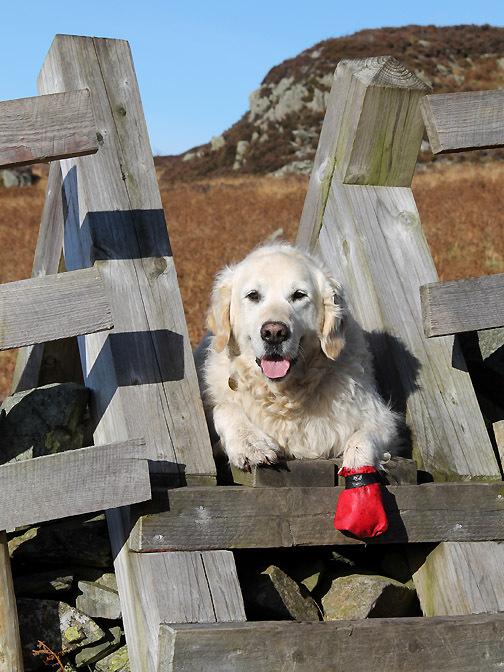 . . and Harry (red paw) Hiley has found some ice from the rock pool at the summit. 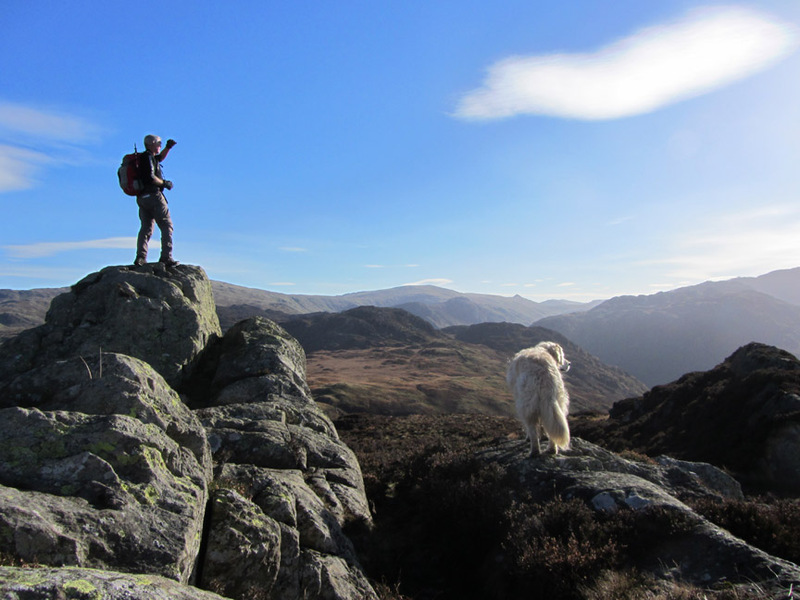 Man and dog have found something to look at that is far away and extremely bright . . .
. . . a lovely view into the sun of the high fells from Great End round to Gable and Brandreth. Long shadows starting to stretch across to Jopplety How . . . 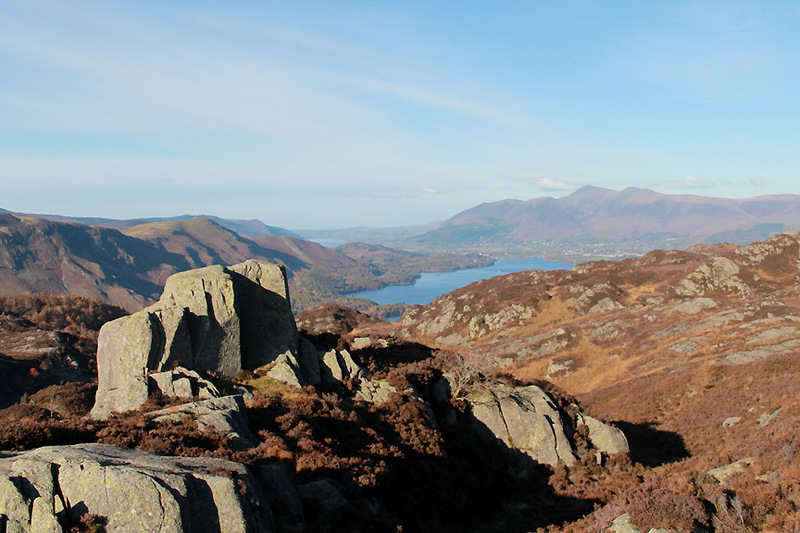 Ether Knott is the next rock summit over. Chance of a photo of the other photographer . 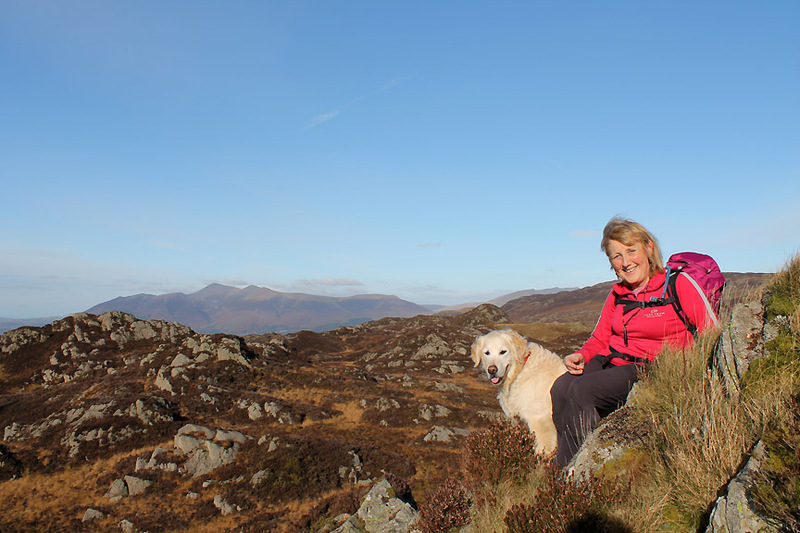 . . enjoying the sun on the summit of Jopplety How. That's a great name . . . or have I said that already ? 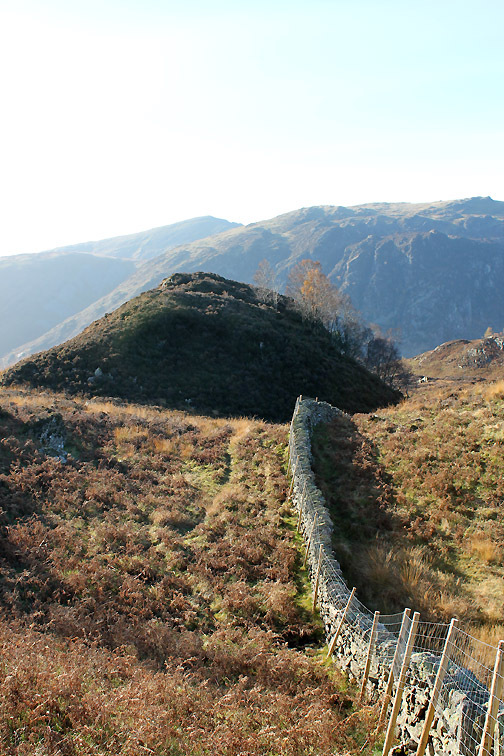 The wall to Watendlath goes east . . .
. . . but we must follow it the other way, west to Borrowdale. Fine views as the afternoon sunshine holds for the prospect of a nice sunset. 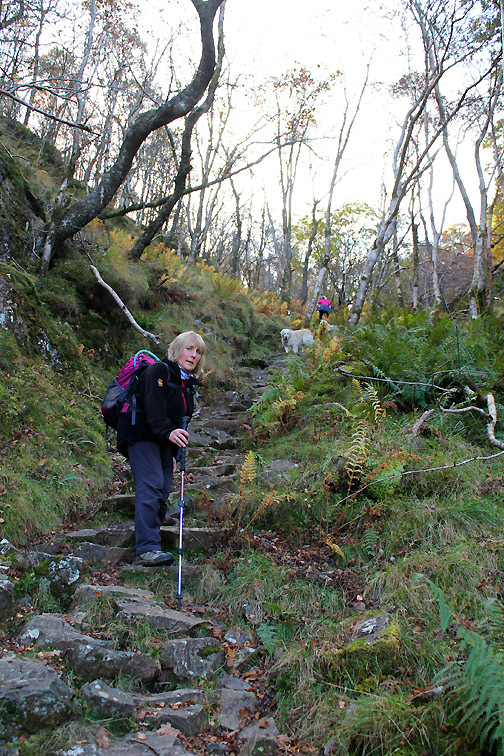 We dropped down past the ladder stile and over towards the lower slopes of King's How once again. 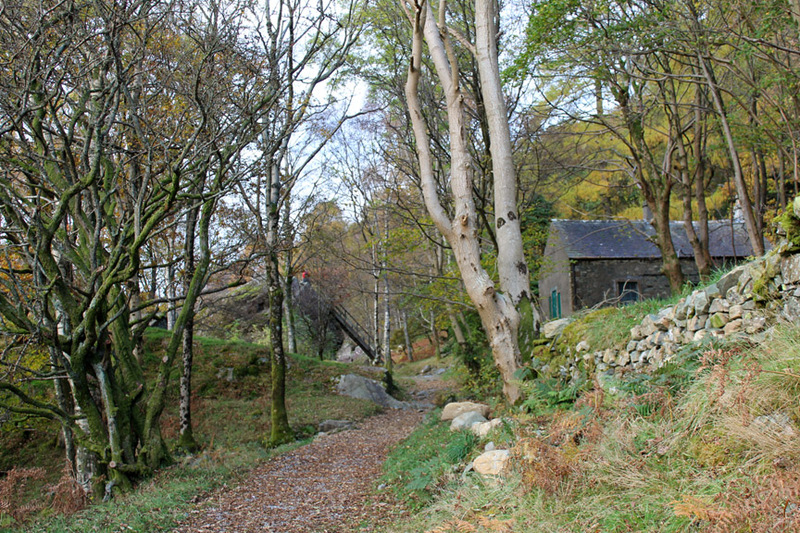 By carefully avoiding reading the map we ended up on the path to Rosthwaite rather than the more direct one down to the road. Still it was a pleasant walk back down into the woods. 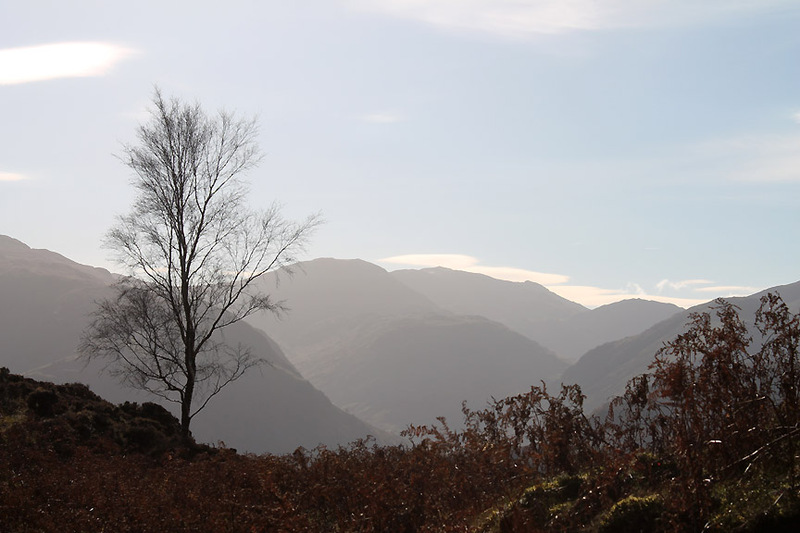 I spy High Spy beyond Castle Crag summit. A fine path, we'll turn right here . 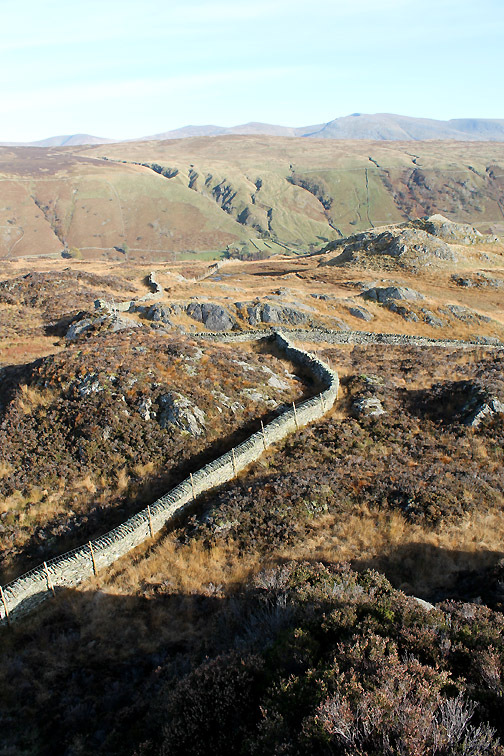 . .
A secondary bridleway which leaves the main Rosthwaite-to-Watendlath track allows us to divert back to the road quicker than we thought. 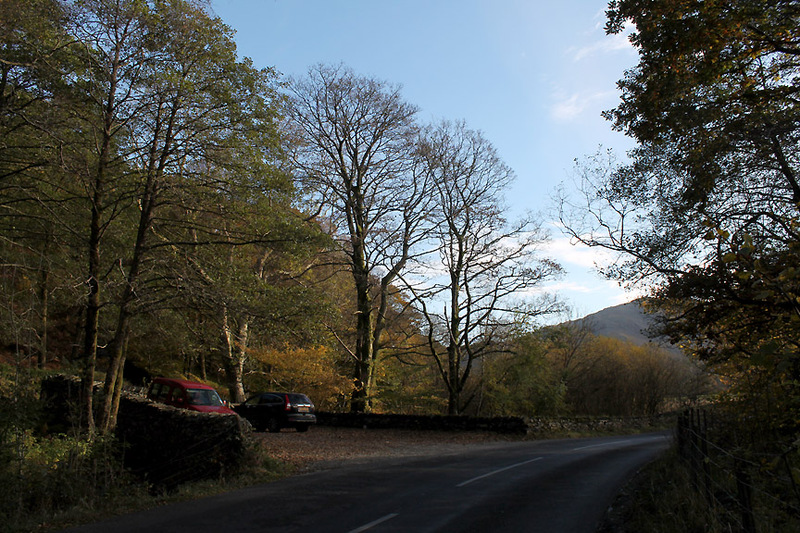 Back on the main road at the edge of the trees. 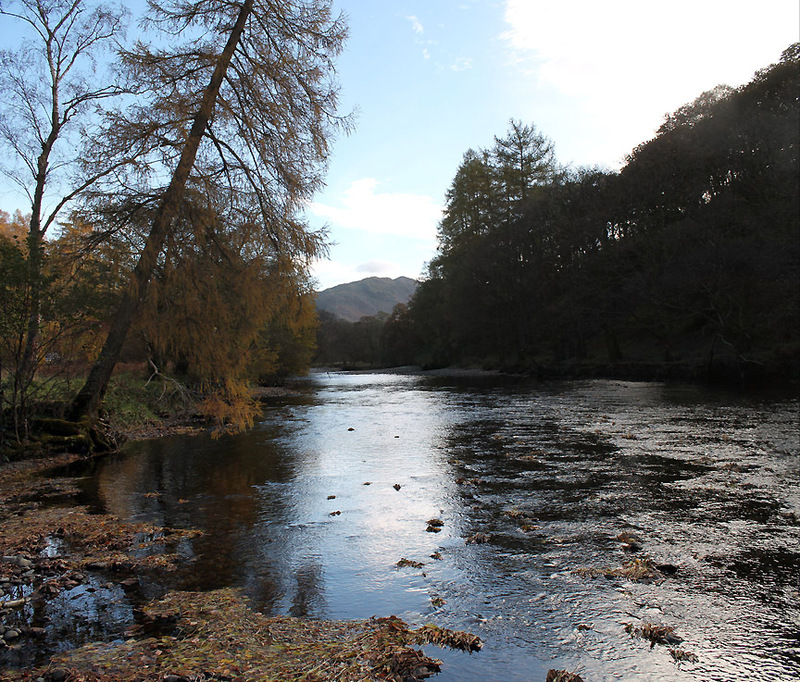 Rather than walk the roadway we crossed through a gap in the wall to walk by the river . . . delightful. 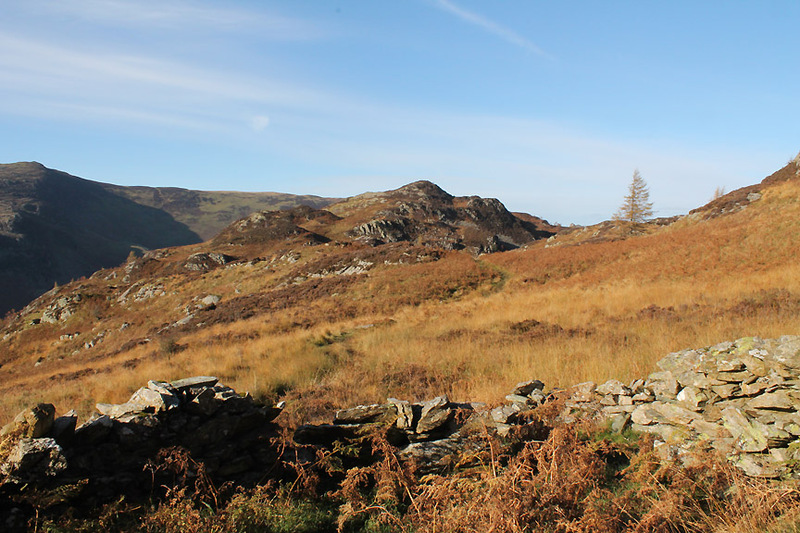 Then it was back across the road once again and onto the southern approach path that climbs up to the Bowder Stone. 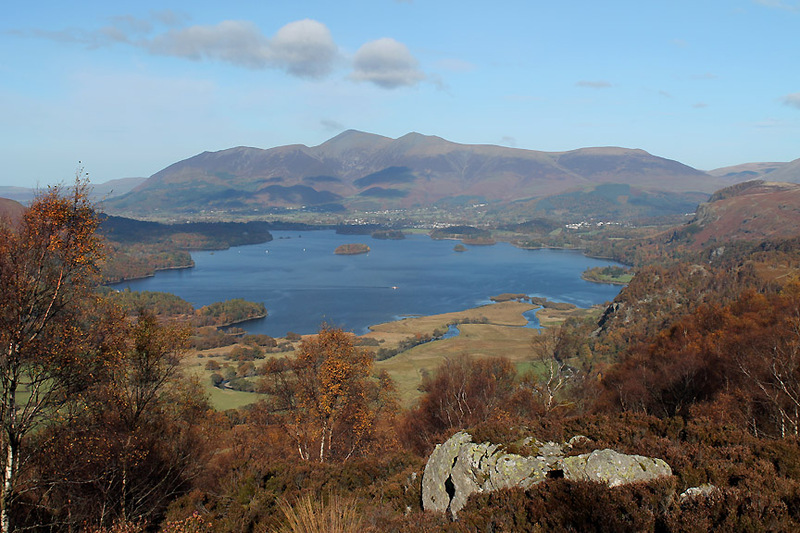 Iconic Lake District landmark . 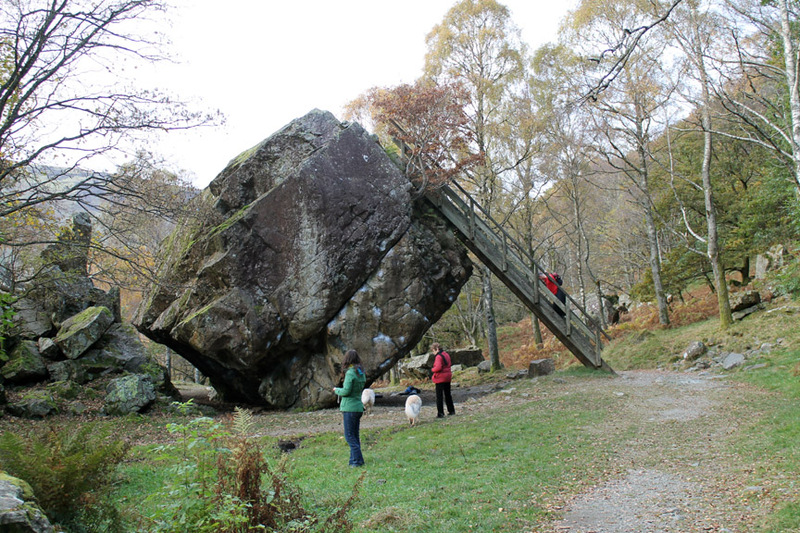 . . the Bowder Stone. Once thought to be an meteor or a glacial erratic boulder . . but now accepted as a rock that had fallen from the local mountain side. Impressive nevertheless . . . as it sits there balanced on a knife edge, albeit dug into the ground somewhat. 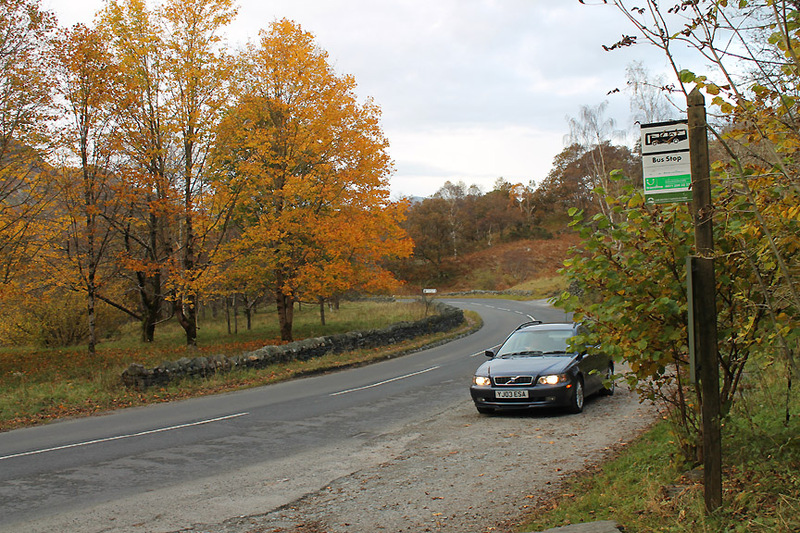 and the car park to end our walk today. This site best viewed with . . . the time and the weather to have two great outings in one day.